TALLADEGA, Ala. – If Joey Logano’s victory in Sunday’s Hellman’s 500 at Talladega Superspeedway was decisive—in relative terms—the race between Denny Hamlin and Austin Dillon for the final spot in the Chase for the Sprint Cup’s Round of 8 was anything but. In an overtime race that went four laps past its scheduled distance, Logano surged ahead after a restart on Lap 191 at the 2.66-mile track and beat runner-up Brian Scott to the finish line by .124 seconds. Hamlin’s margin over Dillon for the eighth spot in the Round of 8 was much smaller. At the end of 510.72 miles, Hamlin outraced Kurt Busch for third place by .006 seconds—roughly two feet—to score the exact number of points he needed to eliminate Dillon from the Chase on a tiebreaker. 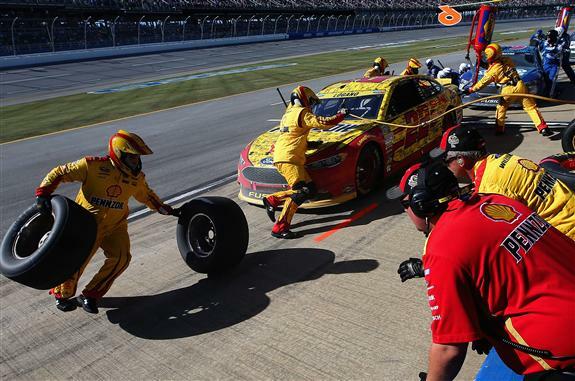 Logano, who won for the second time this season, the second time at Talladega and the 16th time in his career, entered the race on the Chase bubble but settled the issue by leading the final 45 of 192 laps—after Chase hopefuls Martin Truex Jr. and Brad Keselowski fell out with blown engines and failed to survive the Round of 12. “It’s never a layup here at Talladega,” Logano said. “It’s always close. You never get a big lead. (Crew chief) Todd (Gordon) made some good adjustments during the race and found some speed in the car, so that was pretty neat to see some of that. “We needed some things to fall our way if we didn’t win the race,” Hamlin said. “Today things fell our way. The last lap, we went out and earned it. I think back all the years that I’ve been doing this, honestly, 11 years. Seventh-place finisher Kevin Harvick and 23rd-place Jimmie Johnson already had secured spots in the Round of eight, thanks to their respective victories at Kansas and Charlotte. Kurt Busch completed the Round of 8 field comfortably with his fourth-place result. Joining Dillon, Truex and Keselowski on the sidelines was Chase Elliott, who came to Talladega 25 points below the cut line and finished 12th after leading nine laps. Notes: Both Logano and Hamlin benefited from the first caution of the race, called on Lap 42 when Truex’s blown engine dropped oil on the track. Logano had made a complete circuit with a jack lodged underneath his car. Hamlin had just drawn a pass-through penalty for speeding on pit road during a green-flag stop. The caution for Truex’s engine failure prevented both drivers from losing a lap. … Logano earned top seeding in the Round of 8, followed by Johnson, Harvick, Kenseth, Edwards, Hamlin, Kurt Busch and Kyle Busch. All eight drivers start the round with points reset to 4,000. … Scott’s second-place finish was his first top 10 in 49 NASCAR Sprint Cup Series starts. It was also the first top 10 of the season for Richard Petty Motorsports. … Hamlin and Dillon tied for the final spot in the Round of 8 with 3,078 points each. Hamlin won the tiebreaker on the strength of his third-place finish on Sunday.